The Government is planning to introduce citizenship changes requiring Permanent Residents to reside for four years. Anyone granted RRV who re-enters Australia beyond the Must Not Arrive After date on their Visa Grant Notice will become an Special Category Visa-holder (SCV) again. They must reapply for RRV and reside for another year as a permanent resident before applying for citizenship. (Four years if the citizenship changes are passed). For those fortunate enough to have been granted a Resident Return Visa (RRV), it’s important to be aware of the 12-month travel capacity. Unfortunately, some people have been caught out, resulting in having to re-apply for the RRV, and wait a further 12 months before being able to apply for citizenship. If the proposed citizenship changes are implemented it could be an additional four years. 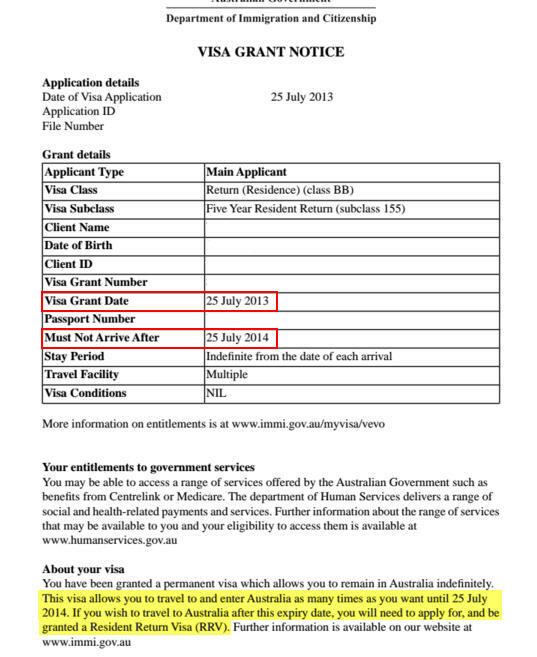 after being lawfully present in Australia, as a permanent resident, for at least two years you will be granted a five-year travel capacity when renewing your RRV. Note: time spent overseas will not count towards the two years. If it is less than two years since you were first granted RRV you will be required to submit certified copies of your supporting documents and a written statement about your ties to Australia. You will also need to include your New Zealand criminal conviction history if you have not previously provided one (now only valid for six months). New Zealanders re-entering Australia without renewing their RRV will be issued a Special Category Visa. This will delay or prevent them from applying for citizenship. Even if you have a valid travel facility, ask the Immigration official to confirm you hold a permanent visa. If you become an SCV-holder again, then reapply for RRV, the proposed citizenship changes could see you having to reside for another four years before applying for citizenship.